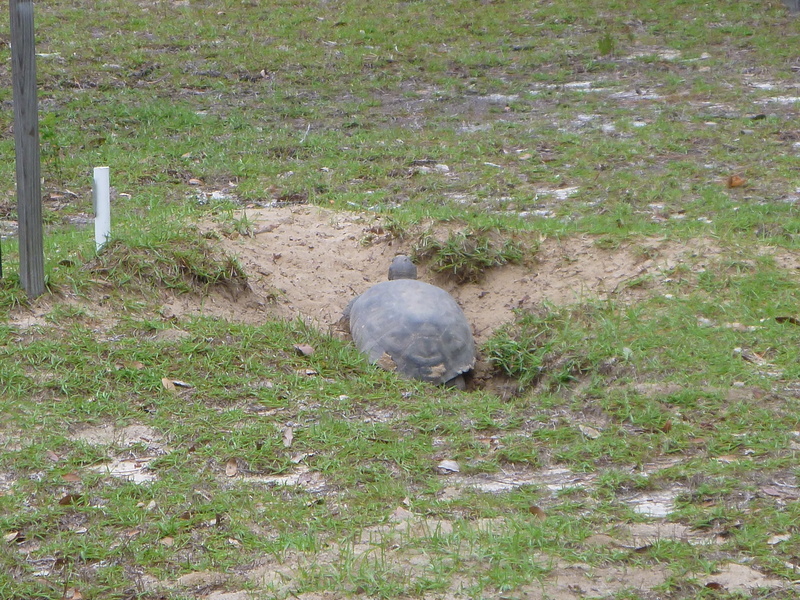 Among the mammals list are the Southeastern Fox Squirrel and the Florida Black Bear. This entry was posted in Uncategorized on November 23, 2013 by marylynanded. 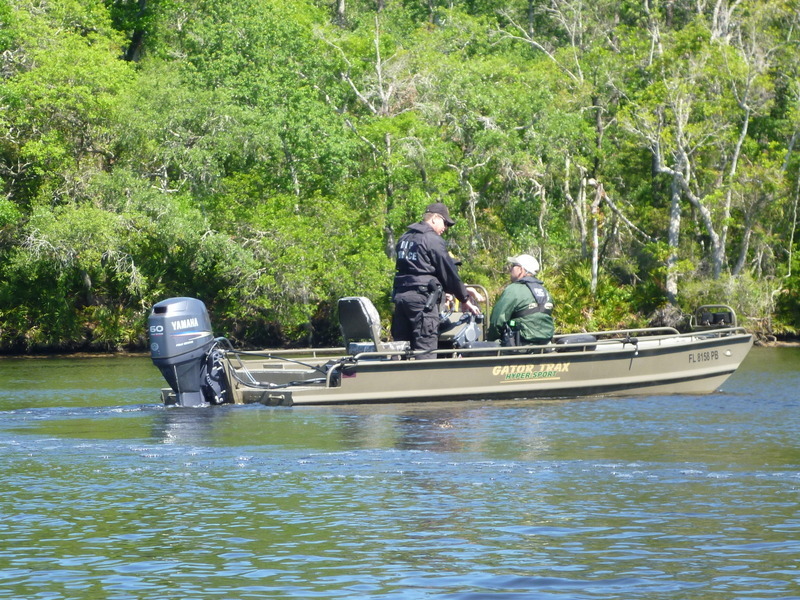 Checking for PFD’s and whistles. This entry was posted in Tate's Hell State Forest and tagged Tate's Hell State Forest on November 21, 2013 by marylynanded. Paddlers enjoying Deep Creek, Tate’s Hell State Forest. 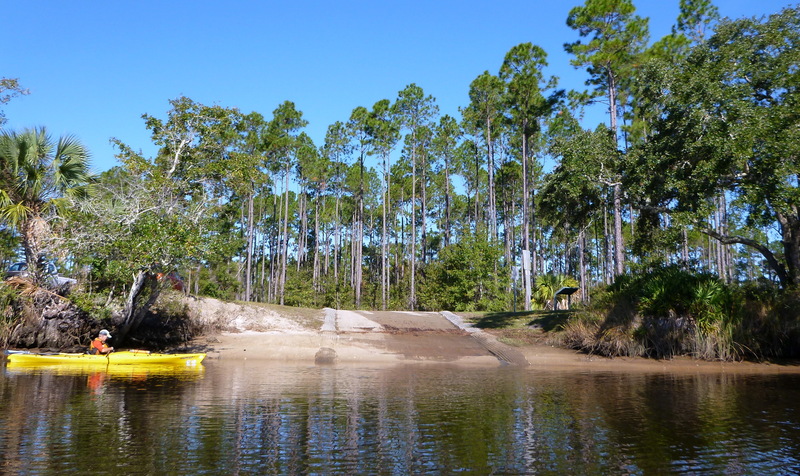 Deep Creek empties into Graham Creek which enters the Apalachicola River. November 12, 2013. 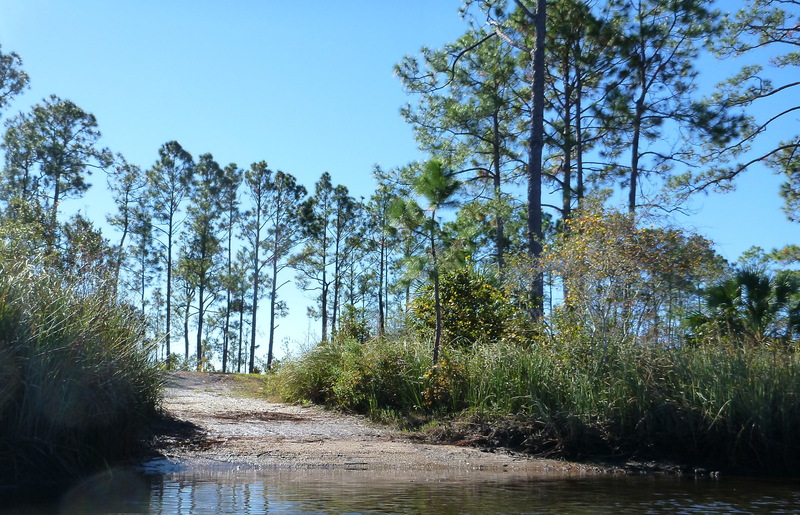 This entry was posted in Paddling, Tate's Hell State Forest and tagged Florida Paddling, Paddling Tate's Hell State Forest, Tate's Hell State Forest on November 20, 2013 by marylynanded. This entry was posted in Uncategorized on November 20, 2013 by marylynanded. 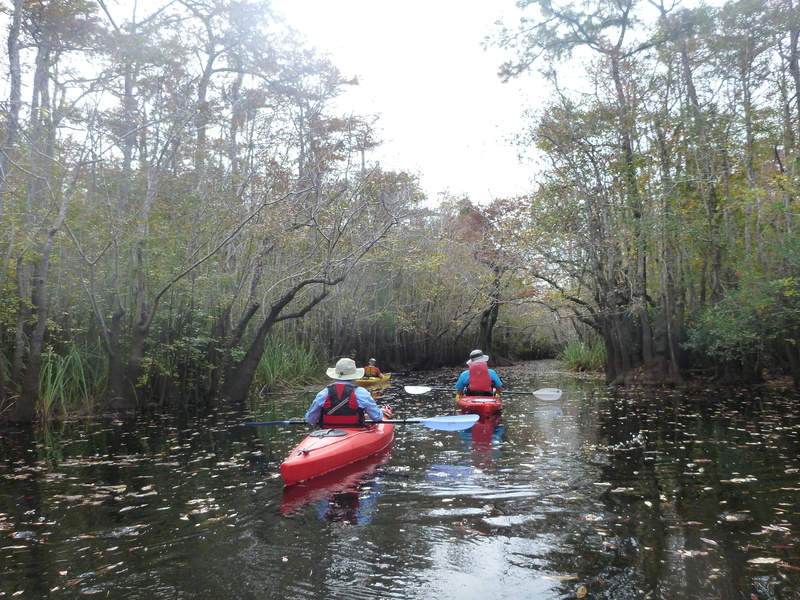 These photos were taken on a paddling trip on November 19, 2013. This is the main putting-in place, with lots of parking spaces, for Whiskey George Creek, off Hway 65. See Whiskey George Landing sign to west. An alternate put-in, right off shoulder of Hway 65, will save you 7.0 miles, about 3.5 miles from Whiskey George Put-in above. Off shoulder parking only. 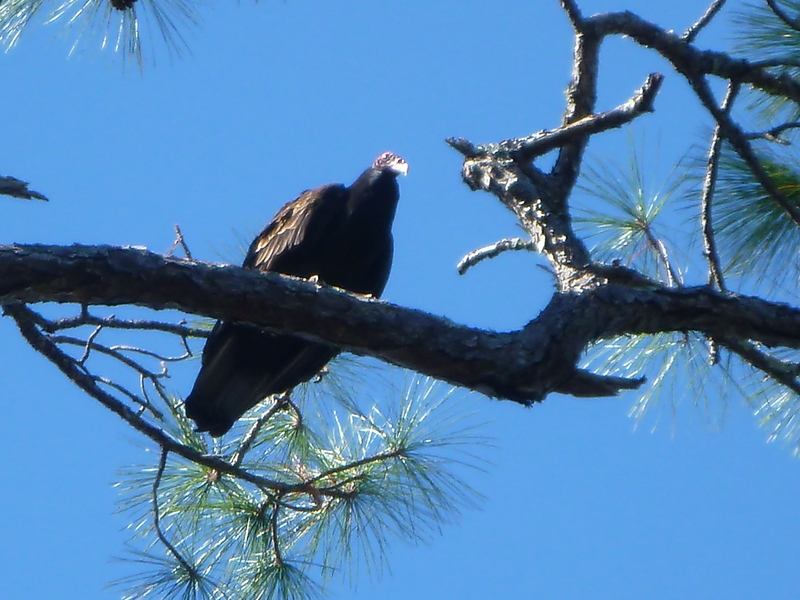 Turkey buzzard, looking for carrion. 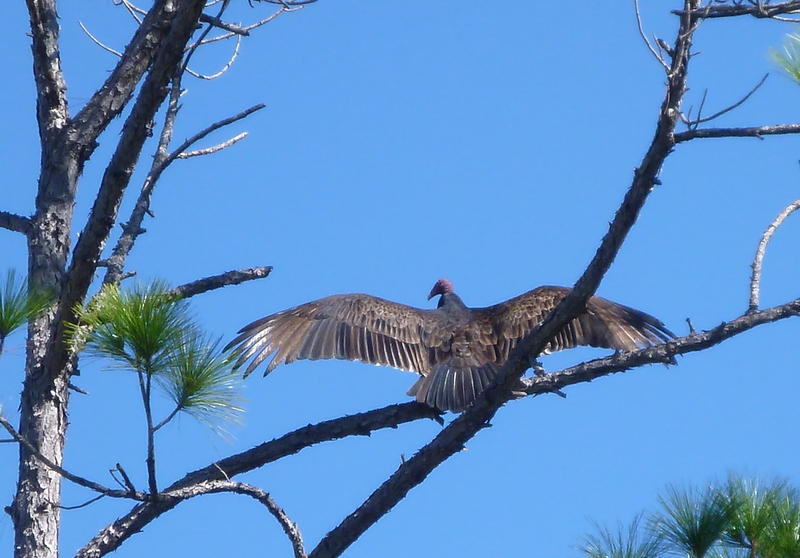 Stepping down to a lower branch, for a better look. Maybe, if I act like an anhinga, they’ll paddle away and leave me alone. And ends here. Only to reappear further upstream. We don’t hike with our kayaks, so we’ll wait when there is more water to the upper stretches. 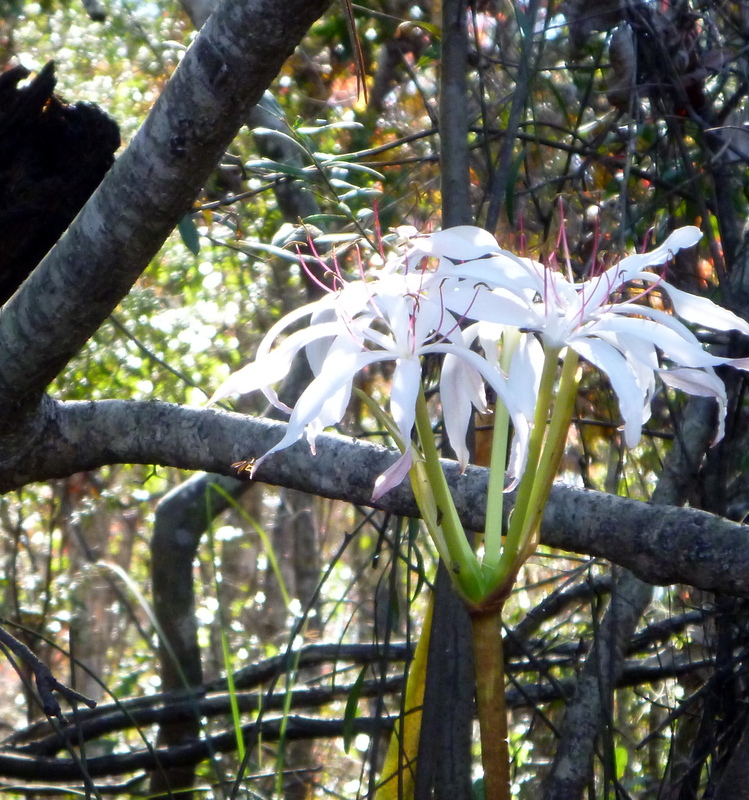 Swamp lilies still blooming in mid-November! 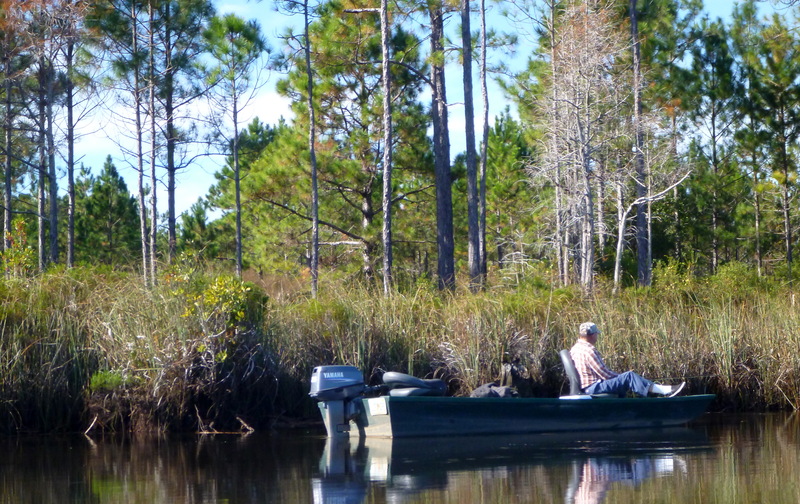 A fly fisherman enjoying his day off, down river. 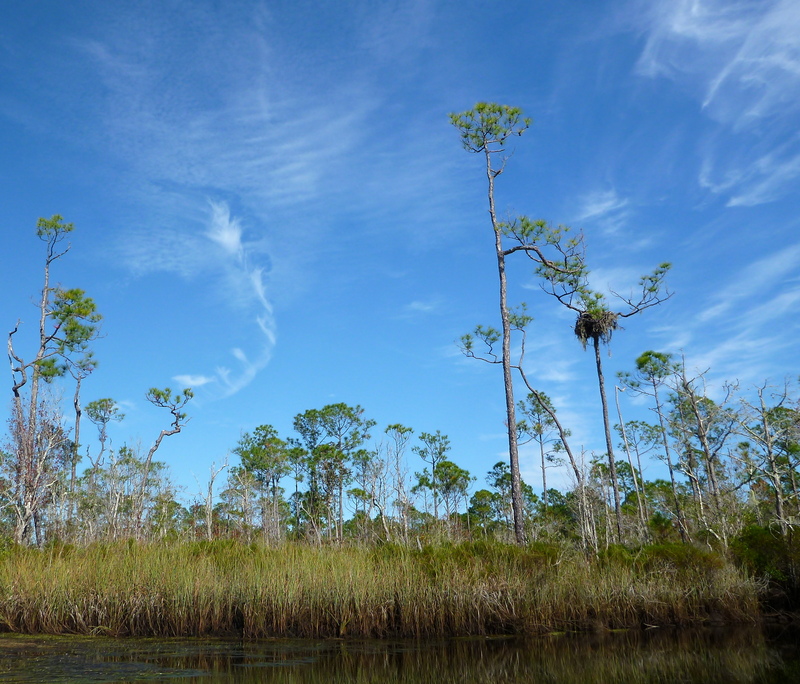 We saw a fisherman catch a 20-22 inch redfish and return it back into the water, ospreys, flocks of crows, kingfishers, a huge alligator which we surprised, a protothonary warbler, several other unidentified birds. 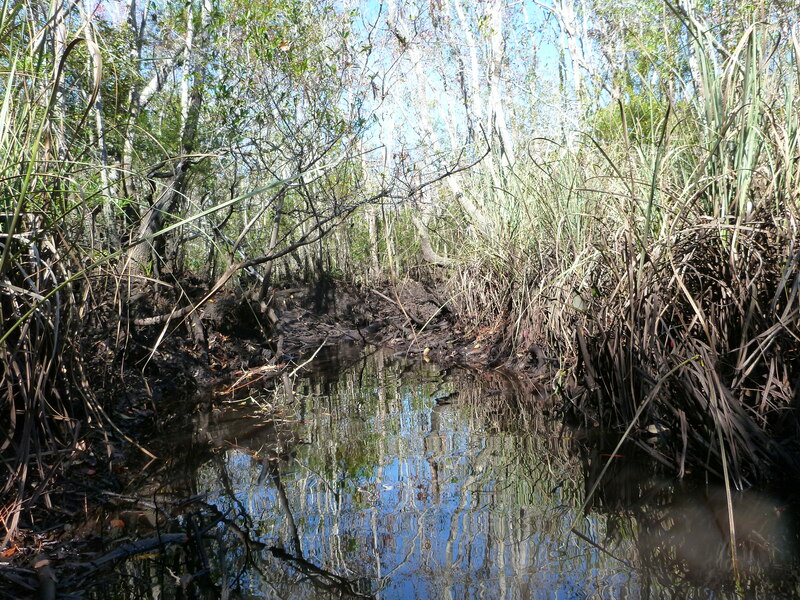 There is a primitive camp site on this creek in Tate’s Hell, accessible by a mucky bank. There is another called Whiskey George campsite, at Forestry roads 10 and 25. 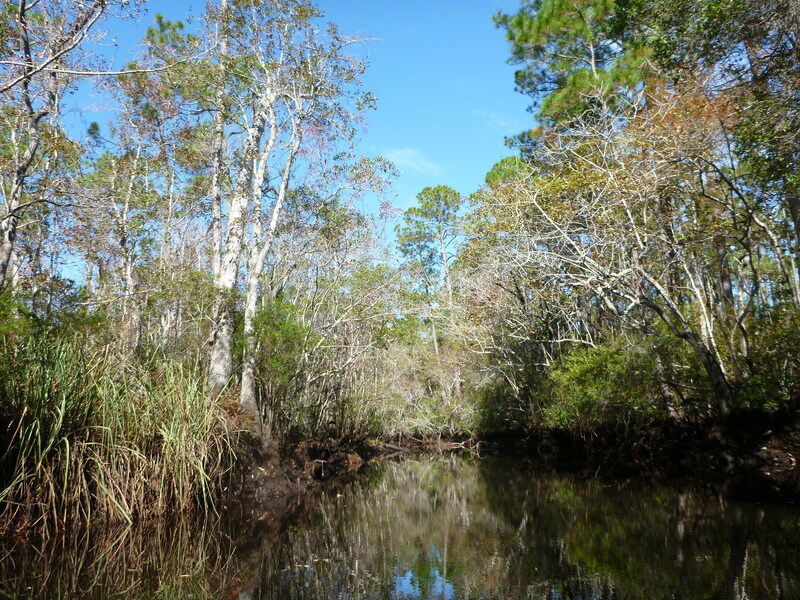 This creek is tidally influenced — we paddled upstream against the tide and returned, also, against the tide. It was not a difficult paddle. It seems from the GRASI maps, that there are military crossings planned in two places on the upper sections of this creek by vehicles weighing up to 2.5 tons, near the Whiskey George campsite. 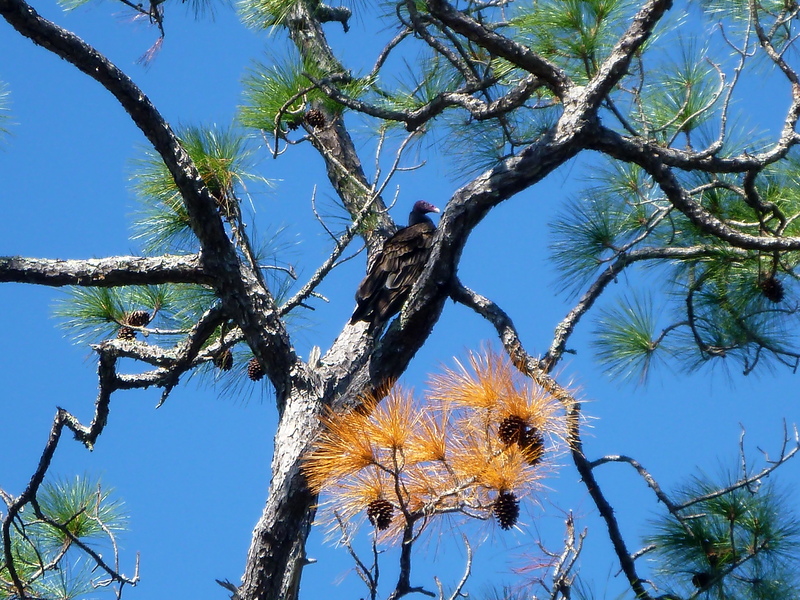 Whiskey George empties into East Bay and then into Apalachicola Bay. 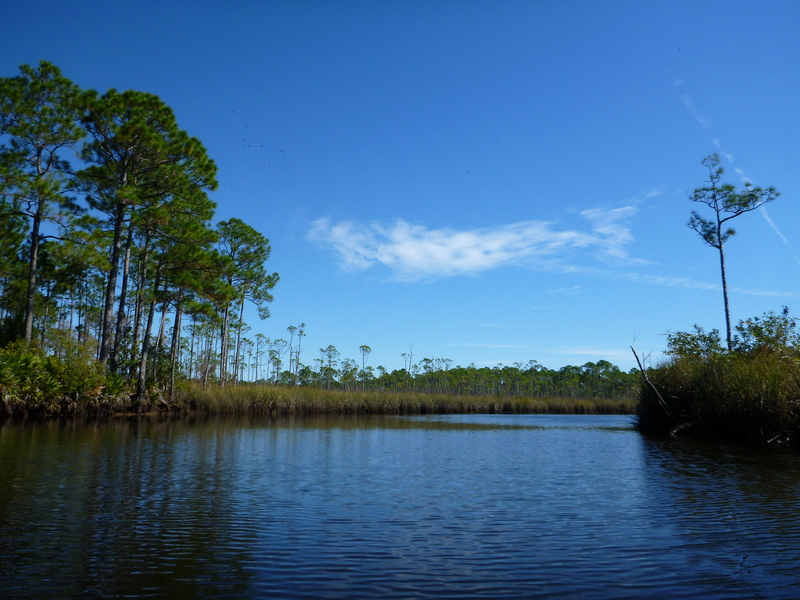 East Bay’s estuary is a very important nursery for Apalachicola Bay. 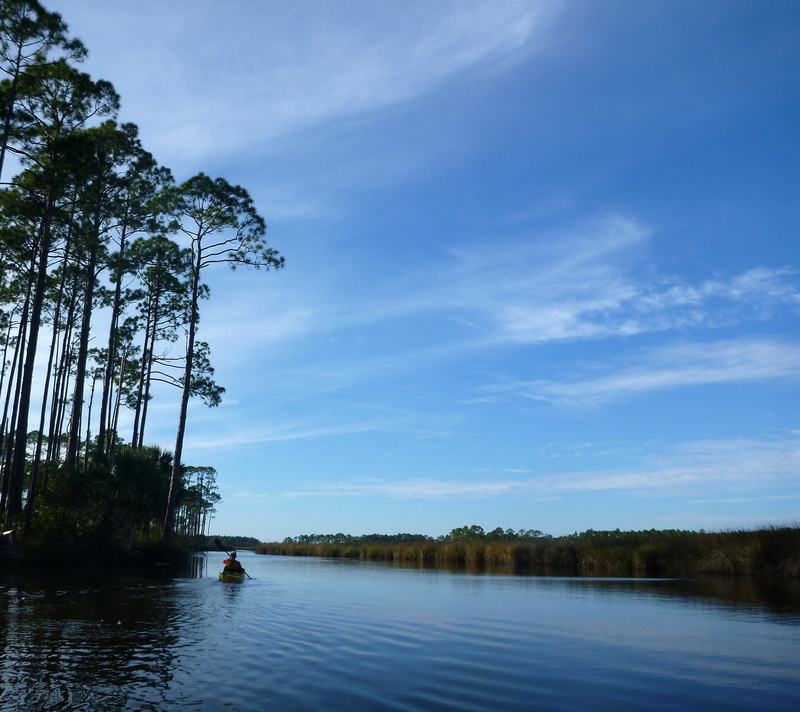 This entry was posted in Apalachicola Bay, Camping, Paddling, Tate's Hell State Forest, Tate's Hell wildflowers and tagged Apalachicola Bay, Florida camping, Florida native wildflowers, Florida Paddling, Paddling Tate's Hell State Forest on November 20, 2013 by marylynanded.